I noticed the most recent uploads at Nintendo Japan YouTube channel include this rather neat looking Devil’s Third trailer. single player campaign that left mostly negative impressions from game outlets while revealing some of the plot and showing off more NSFW ways Ivan can dispose of enemies (the SOD army. No really, that’s the name of the bad guys!). The second part of the trailer is more interesting because it shows off the complete zaniness of the online component of the game. It focuses on clan building and managing, including base infrastructure building and special support units like pro planes, helicopters and even propaganda drops to affect enemy moral. Don’t worry if you just want to play like a lone wolf and blow stuff up, you can skip this whole clan action and just fight for anyone you choose without any allegiance. A mercenary free agent if you will. NSFW trailer follows. I really need to get me some hands on time with this game, everyone who plays the single player mentions broken controls, input lag and inconsistent frame rate as the major concerns but I just like it because, well... there is simply nothing quite like it on Wii U and probably wont be after its release. So it fills a much needed gap in my collection. 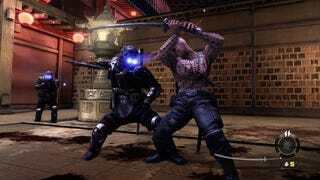 Itagaki-san surprised everyone yesterday by announcing on Facebook that as previously agreed with Nintendo, Devil’s Third Online will be released on PC via Steam. After inquiring Itadaki on his page, I have confirmed that there will be no cross play between Wii U and PC players. Plus the PC game is free-to-start which surely means micro-transactions. The single player campaign remains a Wii U exclusive. *OMAKE* The Japanese website is now up.